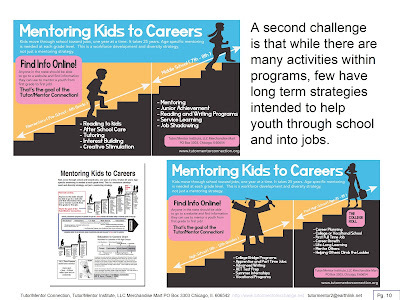 I saw a Tweet this morning from MentoringUSA, saying, "9 million children in the US do not have a #mentor"
This graphic is part of a logic model pdf. 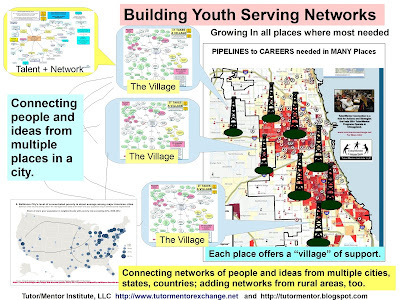 If we believe connecting a youth to extra adults and a wide range of learning an enrichment activities is important, then we need to build and sustain youth serving organizations in all places where kids need extra help, so that volunteers can more readily connect with these young people. This requires leadership from business, universities, religion, media, politics, entertainment, etc. 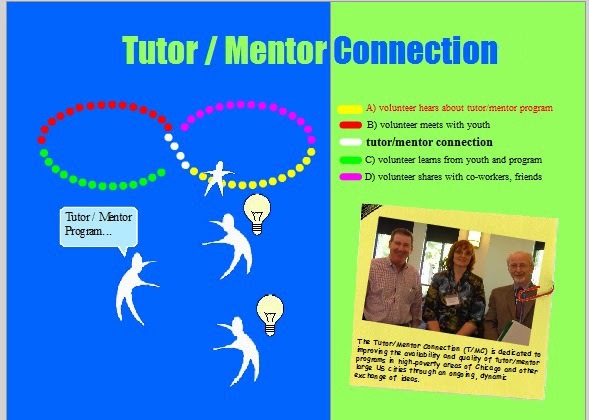 I led volunteer based, non-school tutor/mentor programs in Chicago from 1975 to 2011. The first program was already started when I joined as a tutor in 1973, then became its volunteer leader in 1975. At that time about 100 pairs of 2nd-6th grade youth and volunteers, mostly employees at the Montgomery Ward Corporate Office in Chicago, were starting the year, but only about half were staying the entire year. By 1990 the number was up to 300 pairs, with the number growing from the start of the school year till the end. 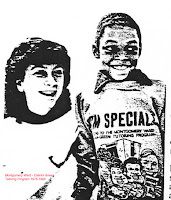 In November 1992 I and six other volunteers formed Cabrini Connections, to help kids who aged out of the first program have a support system helping them from 7th grade through high school and beyond. 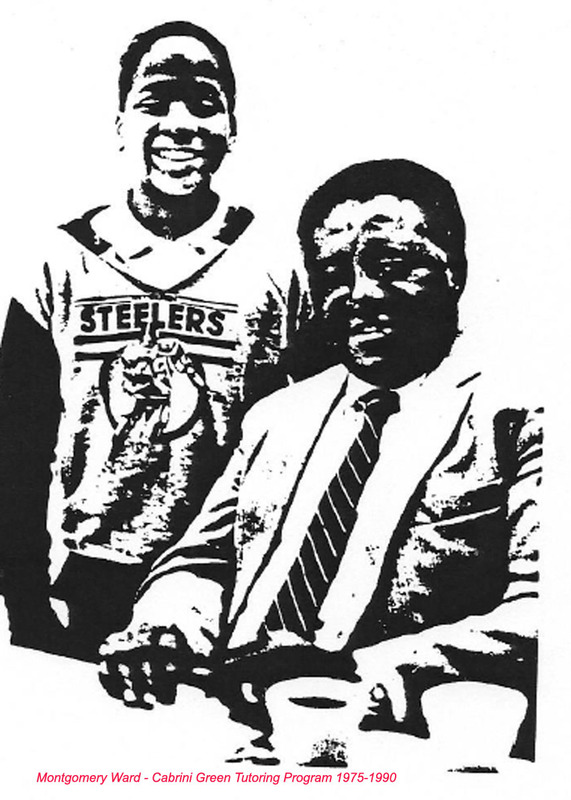 The program started with 7 volunteers and five 7th and 8th graders in Jan 1993 and reached about 90 pairs by 1998. It stayed at that level through 2011 due to limits of space. Many alumni are now college graduates, working, and raising their own families. 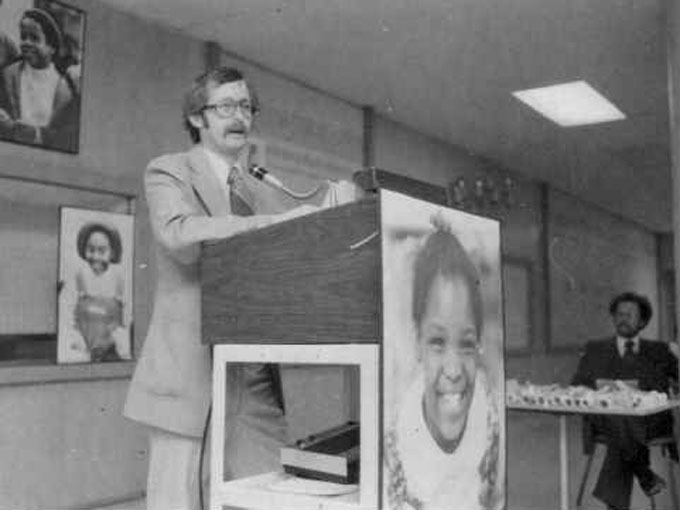 While the program at Montgomery Ward was not a non profit and primarily led by volunteers, the Cabrini Connection program was a non profit, and each year we had to raise money to fund our operations. 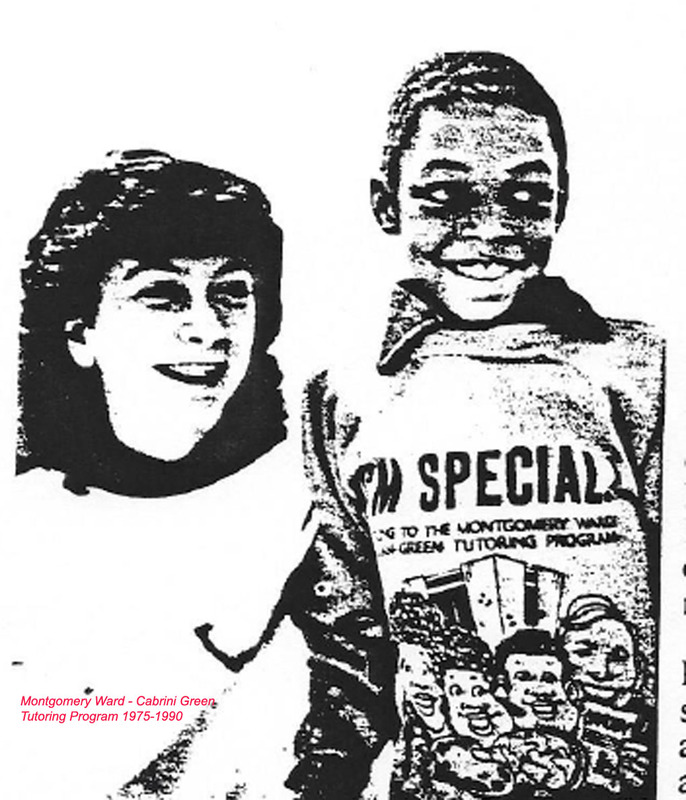 By 2011 we had raised over $6 million dollars, funding both the direct service tutor/mentor program, and the Tutor/Mentor Connection (T/MC), which we launched at the same time (1993). This is a 1965-1990 timeline that shows some milestones in that growth. Based on this long experience of operating a program, I've created three presentations that show steps to starting and sustaining a program. I'm writing about Steps to Start a Program today. Then I provide a set of visualizations and ideas that can overcome these obstacles, such as the one below. 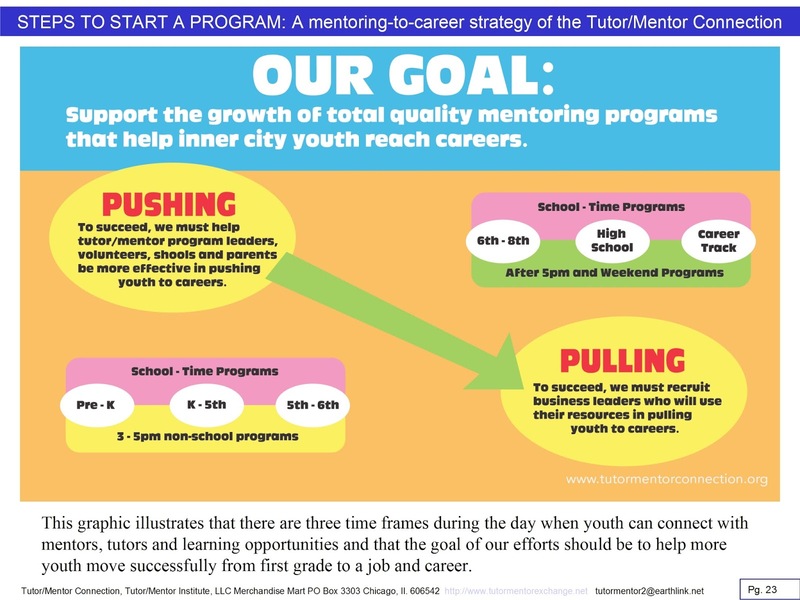 Over my 35 years of leading a tutor/mentor program, I've developed a commitment to comprehensive, mentor-rich programs, which build connections early in a youth's education timeline and try to sustain them as the youth moves through school, toward college and a career. This idea is communicated by the small graphic in the lower left and by the two larger 4-color graphics. As you look at these, I want to emphasize another point. While I created the smaller graphic, Wayne Berg, artist at WANYiMATION, working with Sara Caldwell, a former tutor and long-term supporter, created the four-color interpretation. You'll see several of these in the presentation. What this means is that students from many places could be creating their own versions of these presentations. Interns from IIT in Chicago have been doing such work with me since 2005. 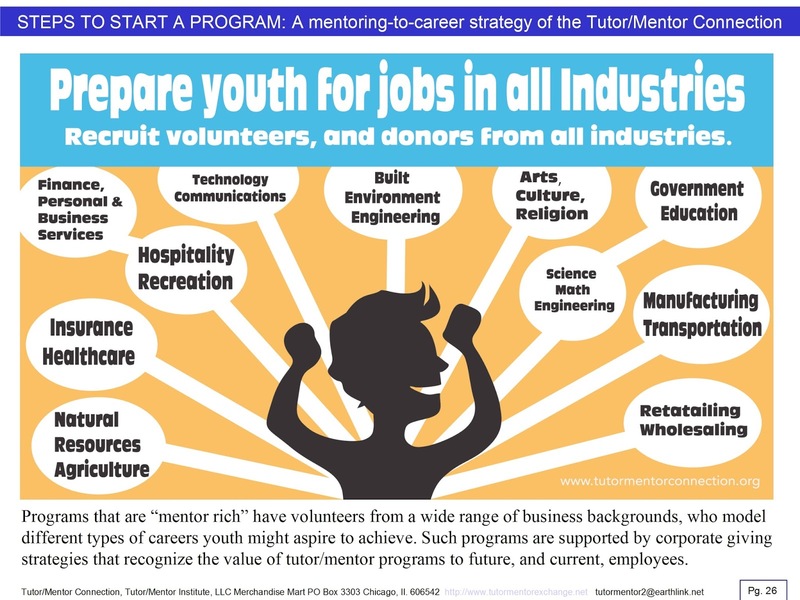 When I say "mentor-rich" I mean volunteers should be recruited from a wide range of business and work occupations and experiences, so youth have many role models they can aspire to achieve, and so the organization has many talents to draw upon to help it grow, as well as many sources of potential funding and support. 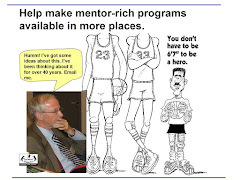 I illustrate this in another presentation that I titled "Total Quality Mentoring". 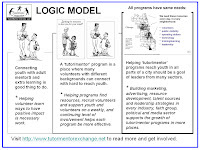 In Steps to Start a Program I use a version of this same graphic to describe the "team" of volunteers (some may become members of your Board of Directors) who need to be recruited to support the work of starting a program, then sustaining and growing it. This Talent Map is a worksheet anyone can use to see that they fill all of the needed functional roles. You'll see an updated version of that talent map in the PDF presentation. While I was a volunteer, leading a tutor/mentor programs with 100 pairs of kids/volunteers in 1975, that grew to 300 pairs by 1990, I also held full time retail advertising management roles with Montgomery Ward. I did not have a lot of time to reach out and "teach" every volunteer everything they needed to know. So I began to create a "resource library" that I encouraged volunteers to draw from to support their own learning and innovations. That library has grown extensively over 40 years and now is available at this link. 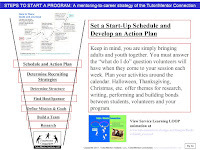 In Steps to Start a Program I emphasize the need to draw your volunteers and co-organizers into this learning process. 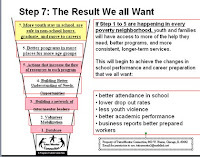 Look at research showing where and why programs are needed. Look at web sites of other programs, in Chicago, and around the world, to see what ideas they include in their programs that you want to include in your own. This learning, comparison and constant improvement should be an on-going part of your operating philosophy. The result of this learning should be a definition of mission, goals and a theory of change, which will guide your program development and future operations. 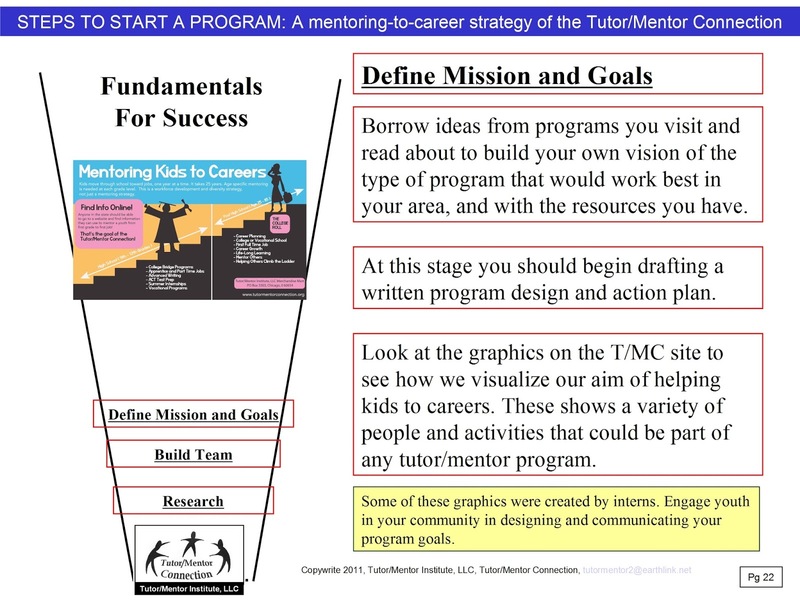 Throughout my blog articles and in Steps to Start a Program I use graphics to illustrate program design principles. In this one I talk about the role of programs, volunteers, parents, peers, etc. as one of "pushing" kids to make the right choices, practice the right habits, etc. to enable them to stay safe and have the lives and careers they aspire to. Don't we all wish kids would listen to everything we tell them? 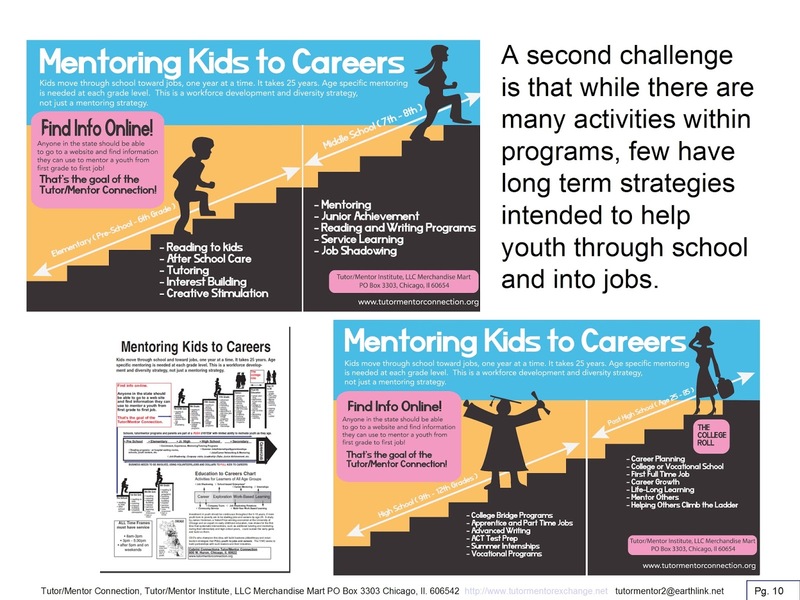 In this graphic I also show the role of businesses, and their volunteers, dollars, technology and jobs in "pulling" kids through school and into careers. In the research section of the web library are countless articles showing how poverty, and the need for income to support a family, lead kids off the path to college and careers. Program designs that include business as full partners can "influence" choices and aspirations and provide experience, income, jobs, apprenticeships and much more. 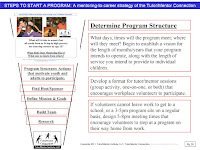 In Steps to Start a Program program design then leads to program location. Finding a place to operate, that is easily and safely accessible to kids and available to volunteers when they are heading home from work is essential in creating a program that will attract and retain a growing number of participants. Once you have a space to operate then you decide dates and times when the site is going to be open and when kids and volunteers will meet. If you have a facility that you can keep open during non-school hours, the staff become mentors and glue that attracts kids and volunteers. While a volunteer might only meet with a youth two hours a week on one day, the youth might visit the site on other days to use the computers, meet in group learning activities with other volunteers and/or just "hang out" with peers. Next you need to determine strategies for recruiting volunteers and students. These are two different challenges. If your planning process resulted in a team of volunteers from local businesses, faith groups and/or colleges, you have people to help you recruit volunteers. If your facility is easy to get to, and hours of operation fit time frames when volunteers are available on an on-going basis, and you design an on-going communications program that encourage volunteers to participate, you should be able to build a corps of volunteers, who as they build loyalty to your organization, will then encourage other volunteers to join you. This is a process. It can take several years for a program to grow. Having a reliable source of student participants is essential to attracting and keeping volunteers. If kids don't show up regularly volunteers will become discouraged and not continue to participate. Thus, your planning needs to develop partners in schools, public housing, and faith groups who will help you with your initial recruitment. Once students start to participate you should build a direct connection to parents and care-givers, support on-going participation. So you want to start a program. Are you including all of these steps in your planning? We're in December now. 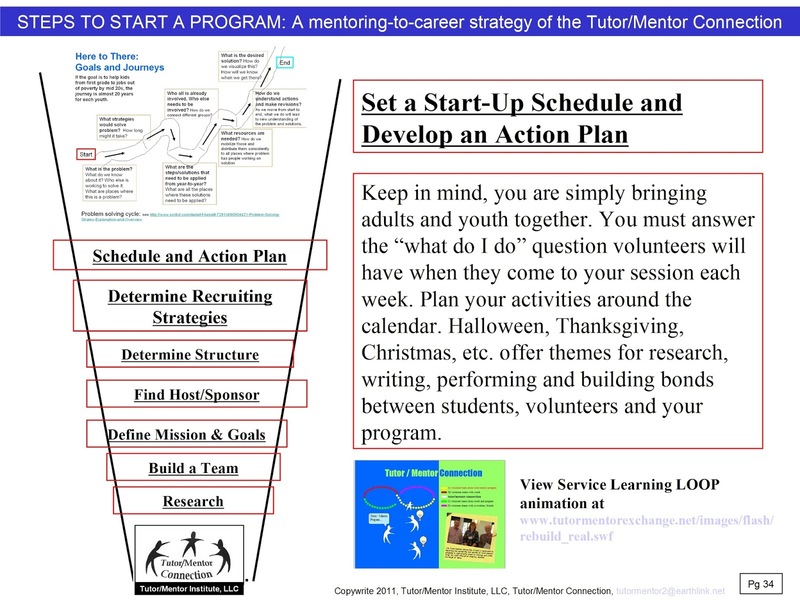 If you use Steps to Start A Program and have success building a team and doing your research, hopefully you're ready by mid June to set a start up schedule and launch your program by recruiting kids and volunteers. Wait! What about funding? Have you found some donors who will provide the money needed to pay rent, insurance, staff, supplies, office equipment, etc? If you've recruited a team from different businesses, they can help open doors for funding opportunities. If you're really lucky, you have a wealthy patron. You may be seeking a government grant, but those come with restrictions and don't cover all your costs. 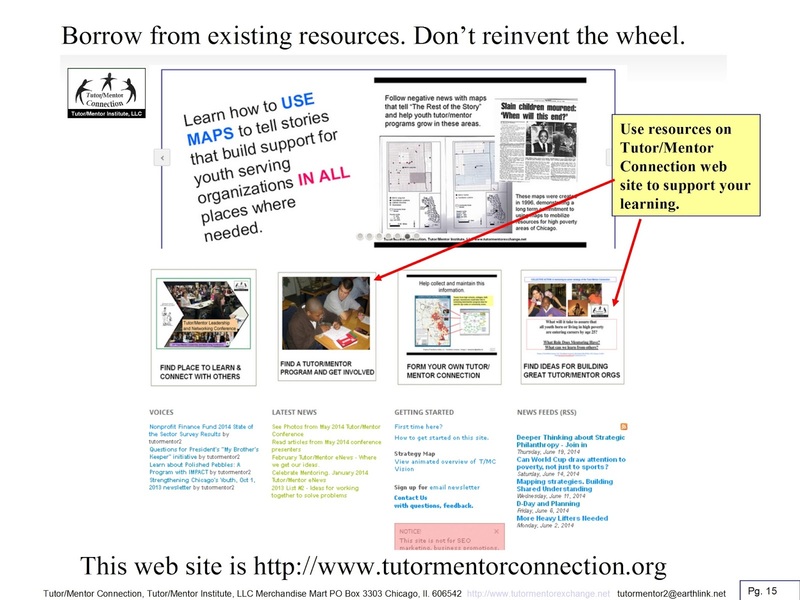 In the Tutor/Mentor web library are many articles to read about fund raising. Do your homework. Know what challenges you face and what resources are available. Hopefully, next August you're starting to recruit kids and volunteers and by mid September you've done the screening, orientations and matching and kids and volunteers are starting to meet. Do you have a plan to track participation, provide feedback, coaching and follow up on a regular basis? How will you evaluate what you're doing so you can learn what works, what is not working and find ways to keep improving? That needs to be part of your planning process. This Shoppers Guide PDF shows some things you should be thinking about before you start your program, and focusing on as you move through the first year toward your 50th year some time in the future. 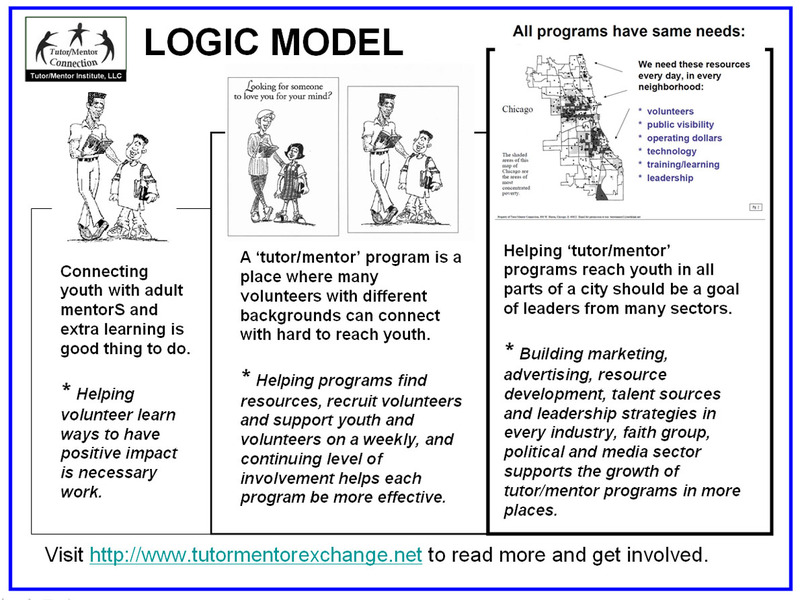 Every child who is helped by a volunteer-based tutor/mentor program to become a tax-paying adult represents a savings and an investment. We are offered with the choice of a 12 to 16-year investment as a child becomes and adult and becomes a taxpayer, vs the potential lifetime costs of public services associated with children who live adult lives that are a drain on social resources, and who raise future children who re-enter the cycle of poverty. 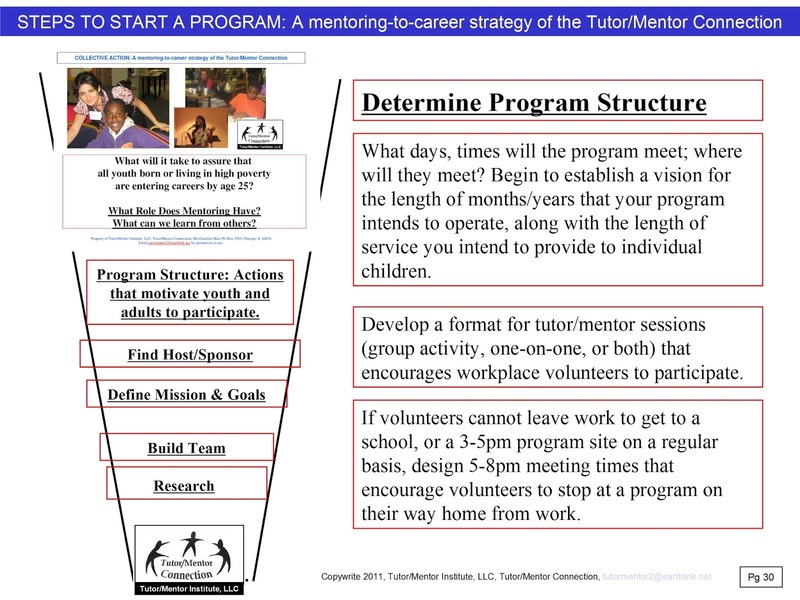 Volunteer-based tutoring/mentoring programs can not-only help individual inner-city children have a wider range of possibilities for long-term personal fulfillment, but they can also engage adults who don’t live in poverty, and educate them to become more personally involved as they build their bonds with the kids they connect with in tutor/mentor programs. These programs enrich the lives of the volunteers, as much as they support the growth of youth skills and aspirations. 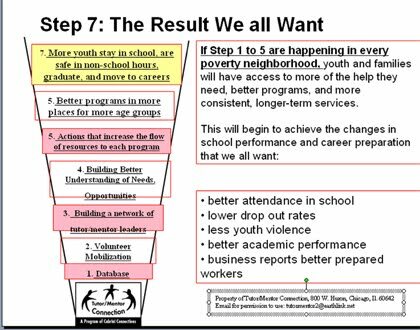 Building strong programs and making them available in more places is a huge challenge. Do your planning. Do it right. I've only highlighted some of the information in the Steps to Start a Program guide. If you want to view the entire pdf, it's available on Scribd.com for a very, very small fee of $2.99. If you'd like my help in understanding and applying these ideas, I'm available for monthly conversations for a small consulting fee. Of course I'm sharing these ideas regularly on my blogs, and most of the pdf presentations I point to are available at no cost. 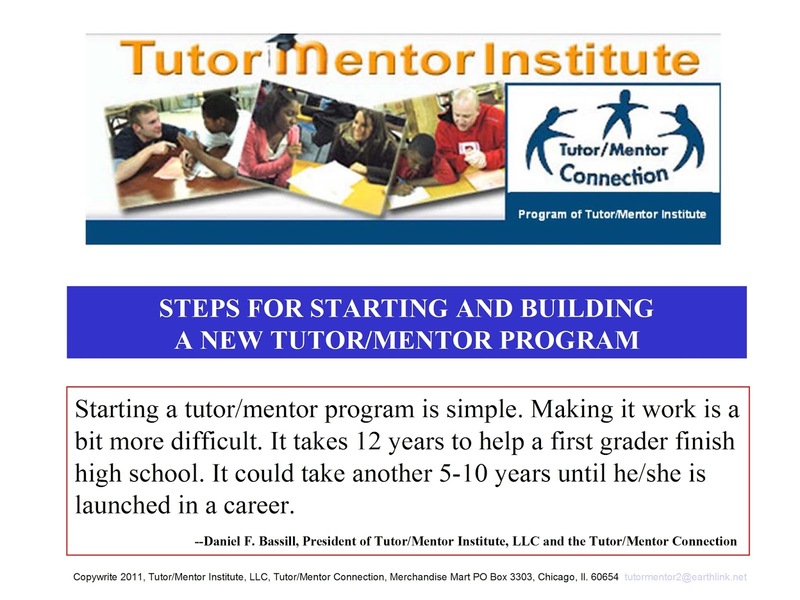 If you value this information, visit this page and consider making a contribution to support the Tutor/Mentor Institute, LLC.